I was determined to hate the Olympics opening ceremony. £27m could have bought half a dozen full-scale West End musicals, or nearly two years’ public subsidy for the Royal Shakespeare Company. It seemed an awful lot to blow on a single performance. The Isles of Wonder would have to be bloody wondrous to justify that kind of expense. So when the pastoral opening sequence failed to feature any closeups of sheep – much to the disappointment of my sheep-rearing neighbour, who had come over to our house specifically to see them in HD – and instead we endured hammy acting, wimpy maypole dancing, limp apple tossing, and some unexplained film of rugby players, followed by the self-satisfied image of Kenneth Branagh as Isambard Kingdom Brunel, I was pretty sure I’d be proved right. Apparently the Americans (including my wife) thought he was dressed as Abraham Lincoln, which must have made it even more confusing when he began quoting Caliban from The Tempest. But after Brunel/Lincoln/Caliban invoked the industrial revolution, the world changed. As the fake grass and fences were carried out by the yokels, in poured a thousand grimy workers, inflatable belching chimneys grew out of the ground, and the world turned grimy. 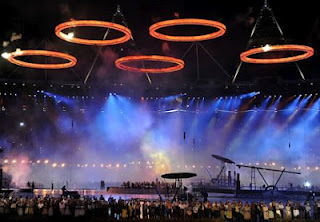 When a huge Olympic ring emerged from an iron foundry and, hoisted into the sky, poured blazing fire, even I wiped away a tear. It was the most effective theatrical transformation I have ever seen. West End musicals spend months getting their scenery to work, and many fail, leaving first night audiences with glitches and delays. I’ve seen well-rehearsed shows wrecked by jammed stage machinery, sticky high wires, actors’ legs twisting at inconvenient moments and power cuts. Friday’s extravaganza was both complex and flawless. Eccentric, iconoclastic, and breathtaking in its ambition, not only was it full of surprise and humour, it was an utterly appropriate reflection of Britain’s position in the 21st century. With the age of empire long gone, there was no dull military pomp, no state-sponsored nostalgia, no dry formality. It was the polar opposite of the embarrassing royal flotilla that had sailed down the same River Thames a few weeks ago. The only serious flaw was an incompetent BBC commentator called Trevor Nelson, who had clearly left either his briefing notes or his brain in the car park. He very nearly ruined the whole spectacle. This was an honest celebration of Britain: a disconnected, but entirely appropriate presentation of our nation’s diversity, talent and complexity. It focused on just a few themes that touch us all – childhood, equality, popular culture, music, and health. It was modern and fun, and I doubt there’s another country on earth that would have dared display such a candid and contemporary reworking of national identity. Some newspapers claim the public are “clamouring for a knighthood for Danny Boyle”. What nonsense: his gong was guaranteed the moment he got the job. But his glory should be shared with the un-credited team of choreographers, directors, designers and technicians. I can’t imagine for one minute that Boyle stood with a megaphone on a stepladder in the middle of the stage and called every shot, lighting change and sound effect – this was delegated, synchronised, chaotically brilliant creativity. And it was 100% British. Some of the biggest accolades must go to three world leaders in their field: technical director Piers Shepperd, Patrick Woodroffe, whose lighting is always mesmeric, and Mark Fisher, a modest, bespectacled, curly-haired architect from Warwickshire, who was the genius in charge of the set design. 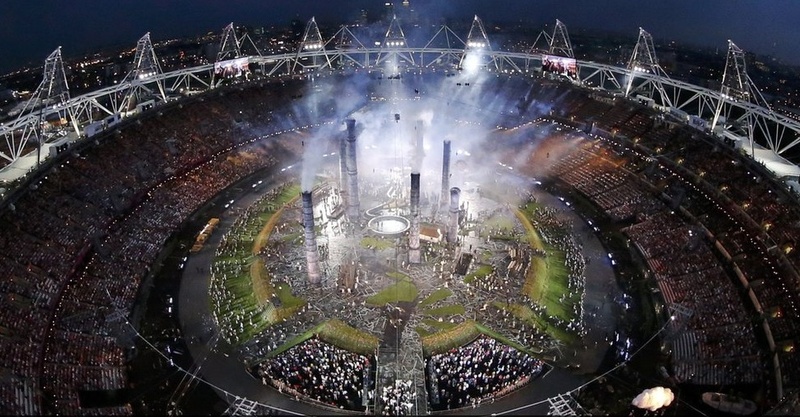 He has created enormous shows for The Rolling Stones, Pink Floyd, U2 and Cirque du Soleil and this isn’t his first Olympic opening ceremony. He designed the 2008 Beijing Olympics too. 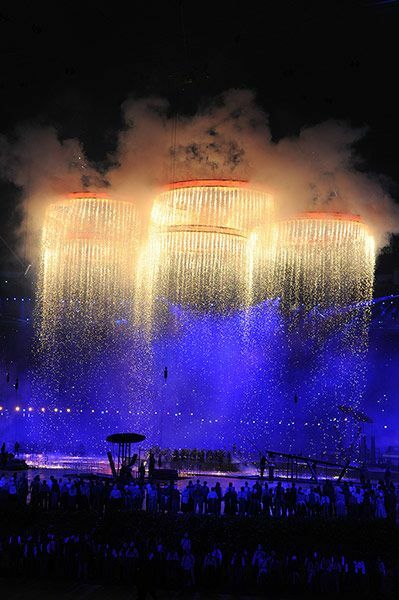 How ironic that, despite all their money and armies, the Chinese had to turn to a Brit to design their own Olympic Games opening ceremony. And this time, with a fraction of the budget, Boyle, Shepperd, Fisher and Woodroffe’s creative teams enthralled the world with a few thousand children, teenagers, workers and nurses, together with James Bond, Mary Poppins, Mr Bean, a very old Beatle, a sky-diving Queen, and, quietly grazing out of sight, some very British sheep. Bravo – it was worth every penny.